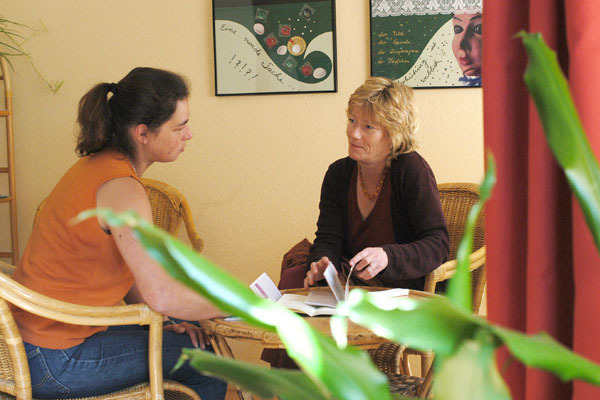 The work of the counselling service aims to make a fair assessment of the specific situation of the individual person and to identify the possibilities without rushing to offer ready-made solutions. The Evangelical Church and its diaconal social service have always worked in a variety of special ways to relieve the suffering of people in need. Psychological counselling is regarded as a part of its responsibility for pastoral care. This represents a response from the church to concrete situations of urgent need affecting the lives of children, young people and their parents, or of families, couple and individuals. The integrated working method of the church counselling centres means that a variety of offers of help and support are available, to accompany people as they look for a way to find meaning and success in life. Each of the church counselling centres employs staff with a variety of expertise in the psycho-social field. This diversity guarantees there is a broad range of specialist services on offer. A high professional standard is maintained and developed through regular training sessions and supervision. Church evangelical counselling centres can be used without reference to health insurance companies, youth welfare offices or other institutions. The counselling centres are open to everyone, regardless of their religion or nationality. In order to ensure confidentiality, the staff are bound by rules of professional secrecy. The counselling sessions are free of charge.